“All my dreams fall and form a bridge of memory where I can get back”. Frances Hahn doesn’t attempt to paint a clear representation of the landscape, but takes from both reality and her best wondering about the place. She assembles these much like a puzzle into a simplified interpretation of beauty. While her visual work is either figurative or abstract landscape, the common subject is imagined memory. Future, past and fantasy have equal weight. Special thank you to the BLACK DRESS EVENT for helping to present this exhibition! 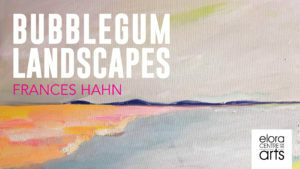 Frances Hahn‘s studio practice is based in Guelph. She has been painting since 2012. While figurative art has been a mainstay, Frances is currently exploring landscapes and abstraction in both paint and collage. Her work is collected widely across Canada, the US and UK and is part of the public collection of the Canadian Mental Health Association.